Ravens’ Director of Player Personnel Eric DeCosta, whose name has been thrown around this week as a potential General Manager candidate for several teams, will not be going anywhere. 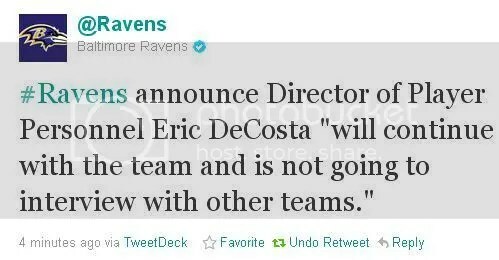 According to the team’s official Twitter account, DeCosta will be staying in Baltimore. This comes as a great relief to Ravens fans. It’s no secret that DeCosta is the GM-in-waiting in Baltimore, prepared to take over whenever Ozzie Newsome decides to retire from the Ravens and (likely) head back to his Alma mater the University of Alabama. Eric is one of the great football minds in the game, and has been with the Ravens since graduating with a Master’s Degree from Trinity College in 1996. The Ravens obviously have a great deal of confidence in DeCosta’s abilities to eventually be a successful GM, as they almost undoubtedly had to increase his pay to entice him to stay, with all these other teams requesting his services. This entry was posted on January 6, 2012 at 12:07 pm and is filed under News, Ravens. You can follow any responses to this entry through the RSS 2.0 feed. You can skip to the end and leave a response. Pinging is currently not allowed.